American Rhythm & Blues duo, founded in 1978 by comedians John Belushi and Dan Aykroyd. As the characters Joliet Jake Blues and Elwood Blues, Belushi and Aykroyd performed as the lead vocalist and harpist/vocalist, respectively. 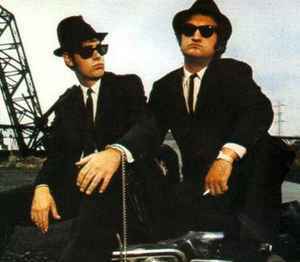 In character, they were the frontmen for The Blues Brothers Band which was composed of renowned musicians. The band made its debut as the musical guest on the April 22, 1978 episode of Saturday Night Live. With the help of pianist-arranger Paul Shaffer, Belushi and Aykroyd started assembling a collection of studio talents to form their own band. These artists included saxophonist Lou Marini and trombonist-saxophonist Tom Malone, who had previously played in Blood, Sweat And Tears. In addition, guitarist Steve Cropper and bassist Donald "Duck" Dunn, from Booker T & The MG's were signed as well. Over time, additional artists such as trumpeter Alan Rubin, guitarist Matt Murphy, drummer Willie Hall and keyboardist Murphy Dunne have performed with the band. After Belushi’s death in 1982, the Blues Brothers Band has continued to perform with a rotation of guest singers and other band members.